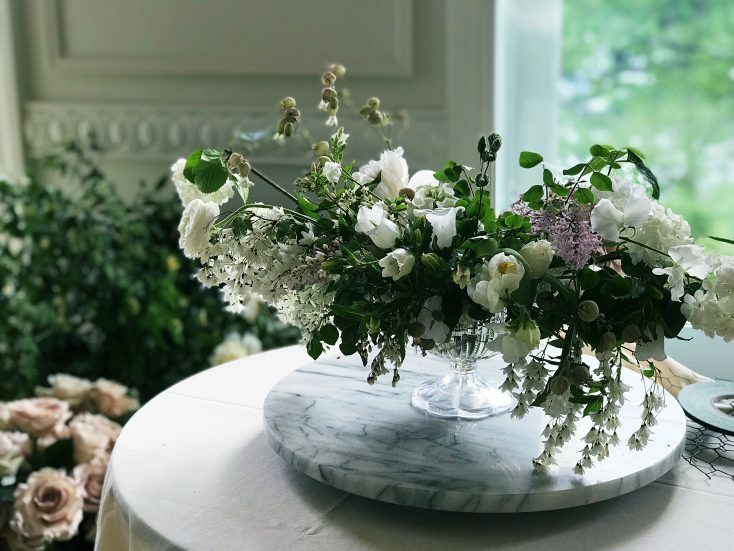 Last week I attended Fetes and Florals, a workshop designed to inspire an artful and effortless approach to entertaining. 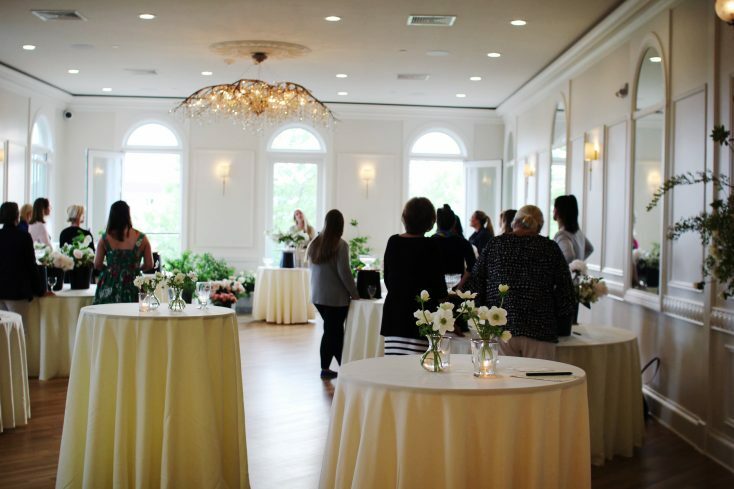 Three amazing female business owners collaborated to host the workshop, Kim Lamothe of Green Lion Design (a good friend and amazing florist who I sometimes I help with wedding installations), Caitlin Hill of Citrus and Cedars, and Ashley Begley of Ashley D Studios. 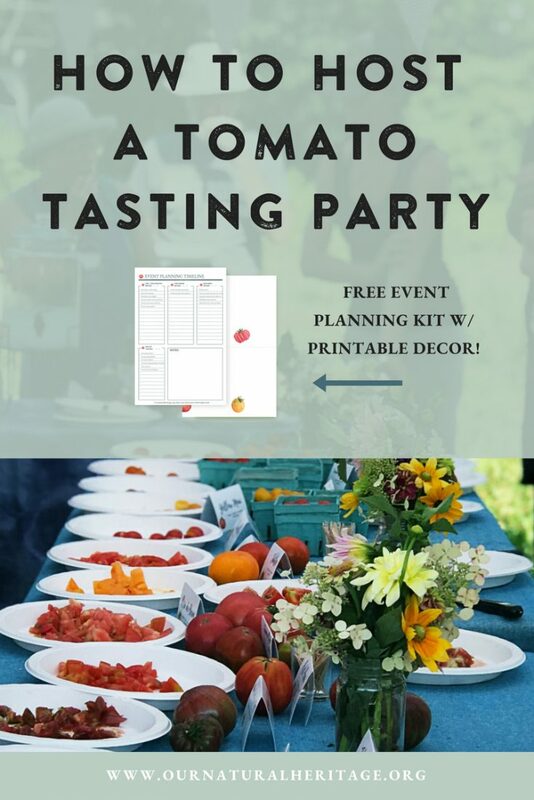 We learned some unique ideas for creating and hosting a memorable event that celebrates summer. 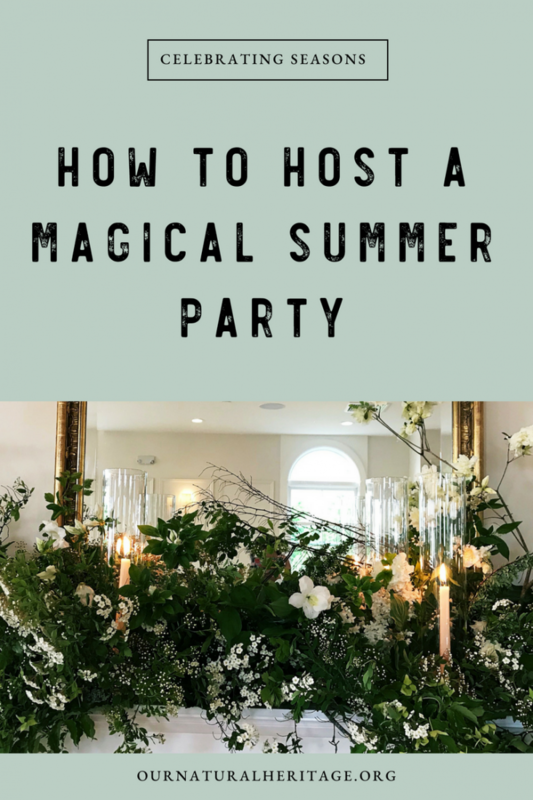 Read on to hear more about the workshop, and as a fun bonus I have created a free printable magical summer party place card template to help you reflect and celebrate this wonderful upcoming season! 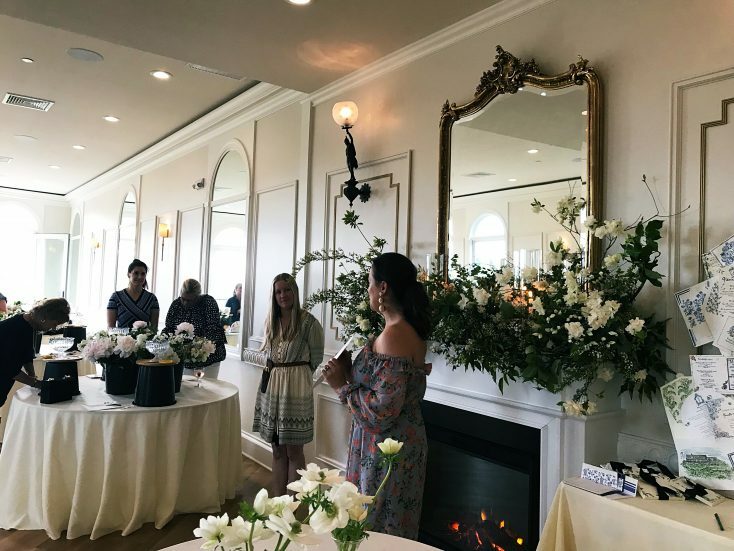 Fetes and Florals was held at a new Newport, RI event space called Queen Anne’s Loft also run by a female entrepreneur, Amanda Roderick. As soon as I walked through the door into the beautiful second story space, I knew we were in for something special. 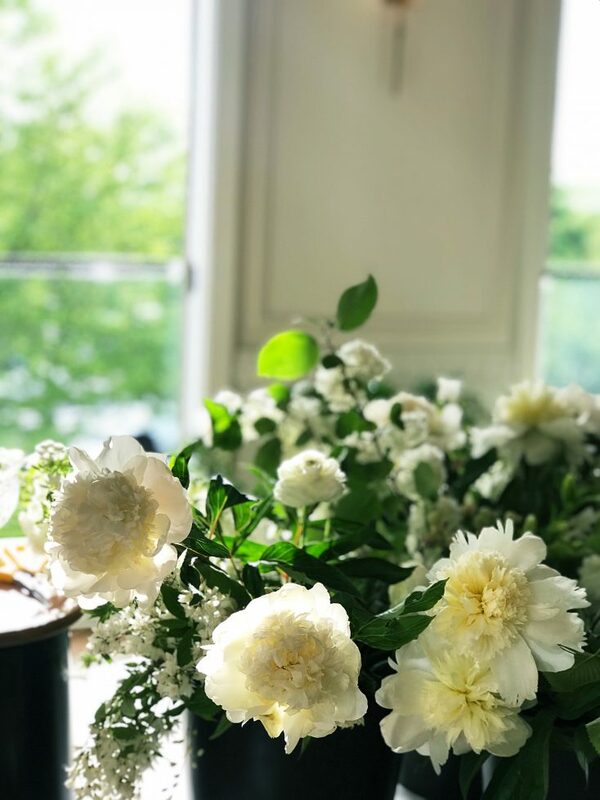 The early evening’s golden light streamed in from the floor to ceiling windows and mixed with the glow that flickered from delicate votives strewn about the room. The sounds of bustling downtown Newport were somewhat hushed as they floated up from the street below. 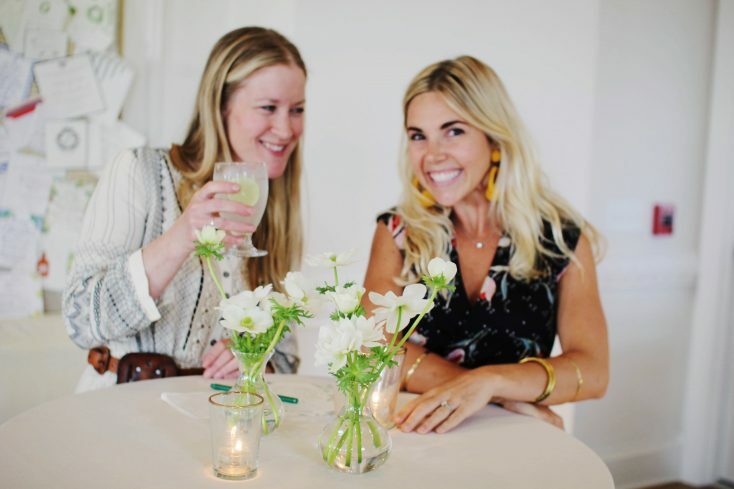 We sipped our delicious herb-infused cocktails and slowly perused buckets upon buckets of amazing spring flowers that we would be using to create our own take home arrangements. Ashley prepared notecards for each guest to fill out, with thought-provoking questions about our favorite summer memories and intentions for this season. It was a wonderful way to kick off the evening, we each read some of our answers aloud and dreamily recalled our own summer memories. 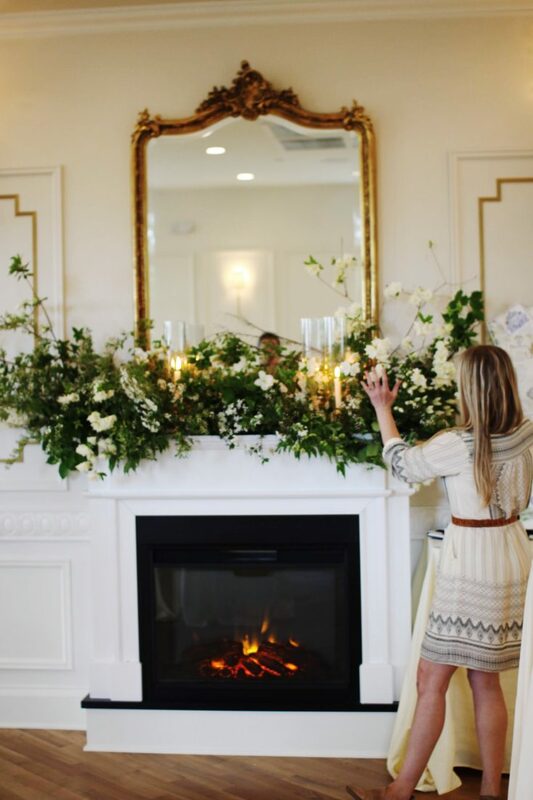 We then learned how Kim constructed the incredible fireplace mantel arrangement. True to Green Lion’s ethos, all of the flowers were local or US-grown, and no floral foam was used. In fact, everything on the mantel arrangement was foraged from Kim’s own garden. 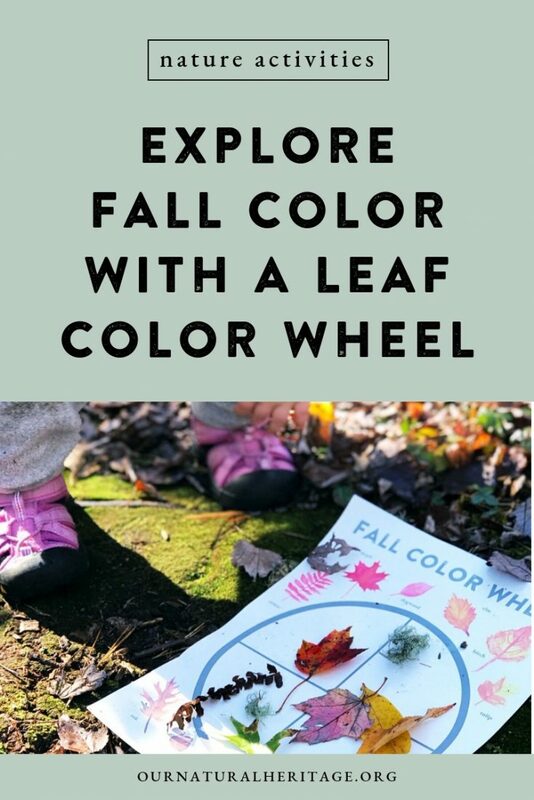 She explained how you can often find amazing material in your own yard or neighborhood and that she often uses the same plant in different stages of bloom for a variety of texture and effect. 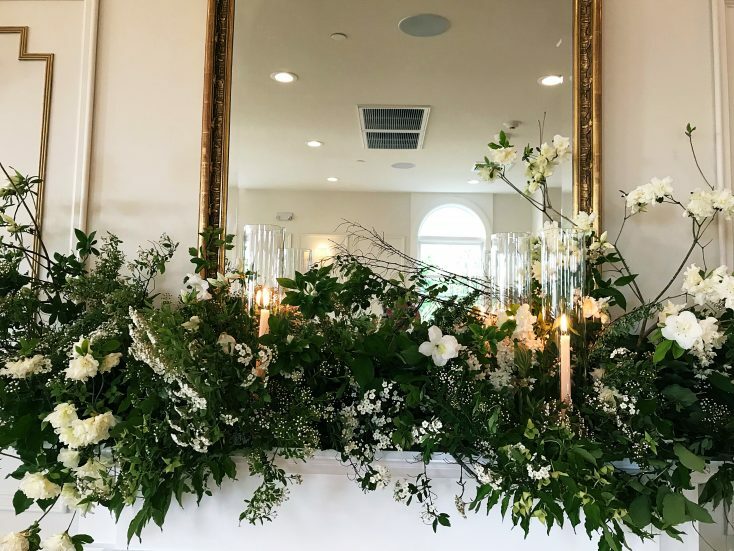 For example, the branches at each end of the display are white azaleas, but the ones on the left are still buds, while the branches on the right are in full bloom. We also heard more about Ashley’s exciting portfolio of design work, much of which is creating bespoke event invitations. 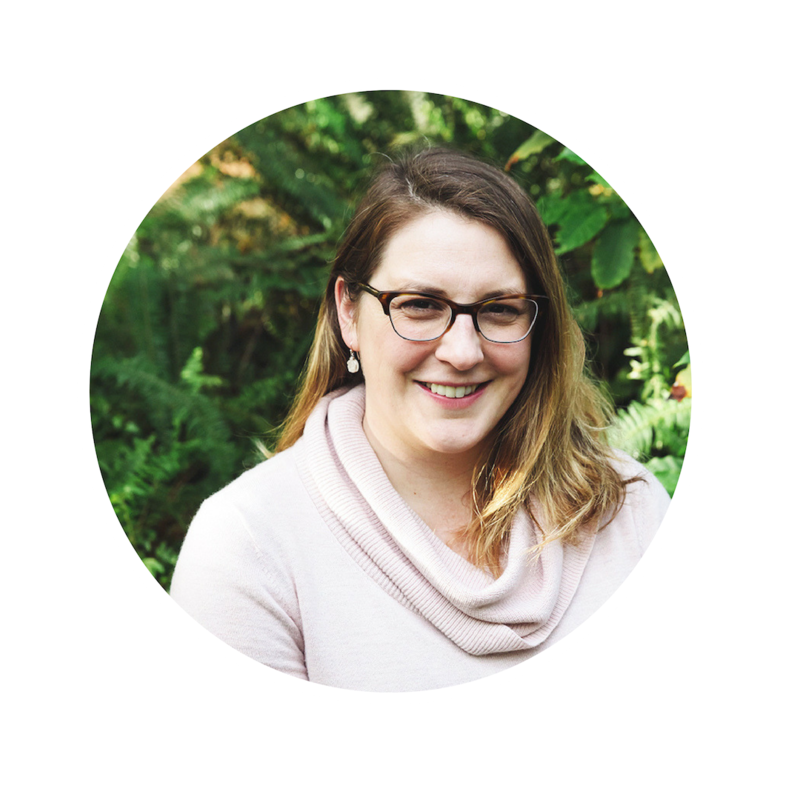 She shared how small, special touches, such as personalized place cards or a custom crest designed for a family event can create a big and memorable impact. And then it was time to get our hands on those gorgeous spring flowers! 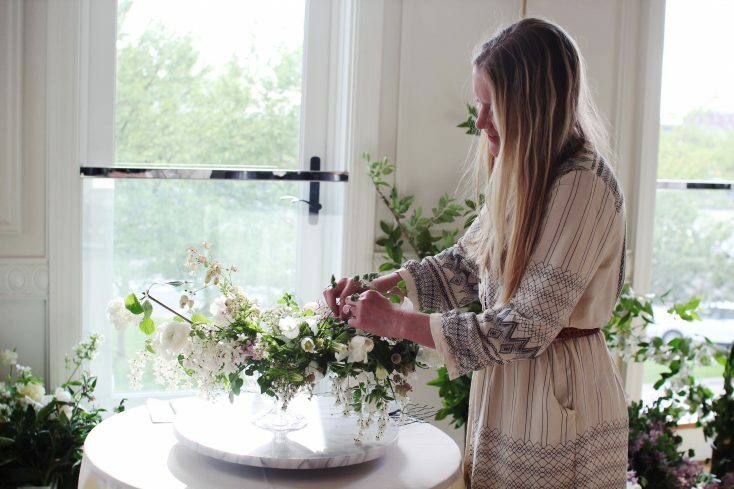 Kim, who I will now refer to as the “Bob Ross of Floral Design” because of her calm demeanor and encouragement to follow the flower’s will, demonstrated how to assemble a floral arrangement in a shallow compote dish. She explained that the compote shape is easy to work with and looks best when you leave a little dip in the middle. She told us that she often starts with greens to create structure and movement before adding flowers. It was a wonderful evening, and I was reminded of the magic that can be created by just a few thoughtful touches every time I walked by the arrangement I brought home. Serve a signature cocktail inspired by the season’s flowers and produce. Even a single lavender stem can turn a drink into a multi-sensory experience! 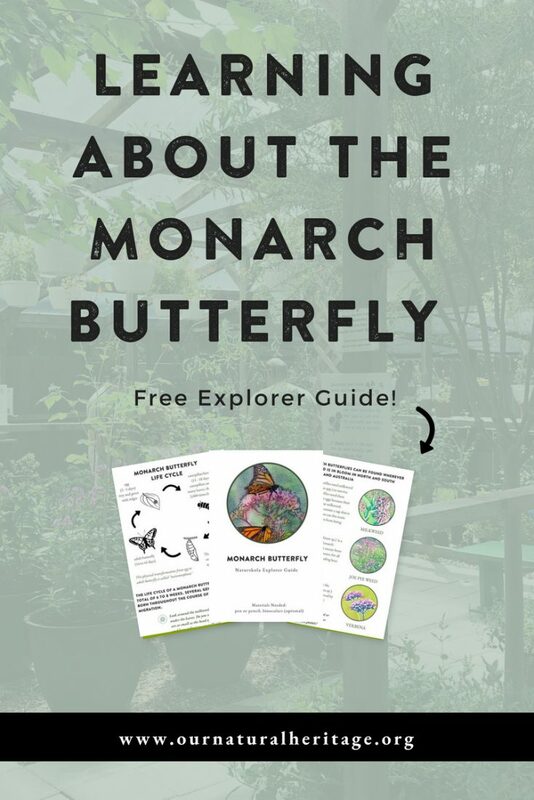 Icebreakers can seem cheesy yes, but something as simple as asking everyone to recall a favorite summer memory is a great way to connect your guests, engage their senses and help them set intentions for enjoying a wonderful summer. Don’t overlook the wild plants in your own backyard or roadside. 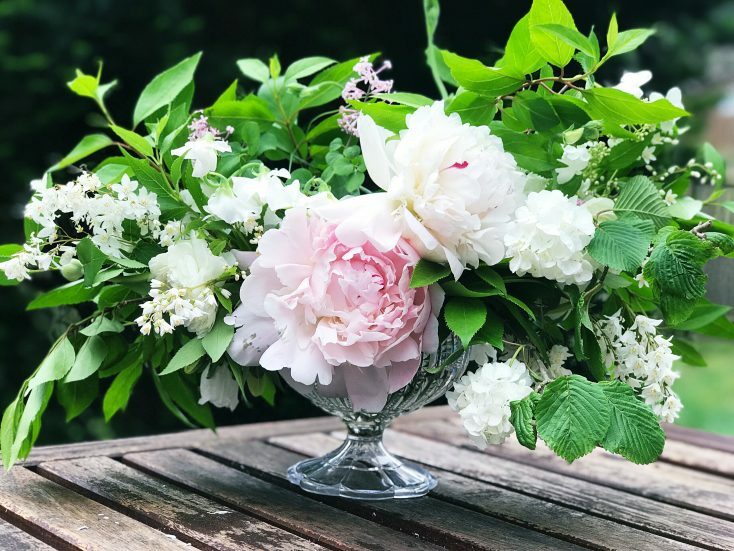 Species such as viburnum and azalea are plentiful in New England and you only need a few stems to add a gorgeous wild structure to your flower arrangement. 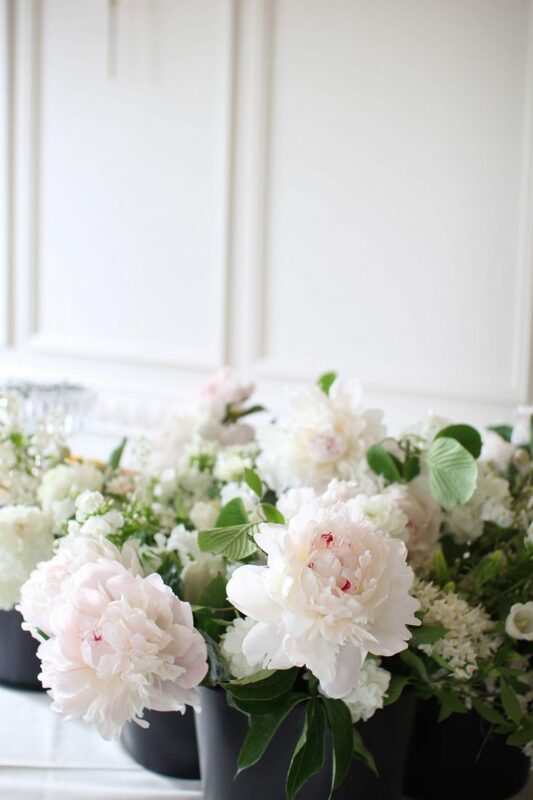 You don’t always need a showy arrangement in a large vase. 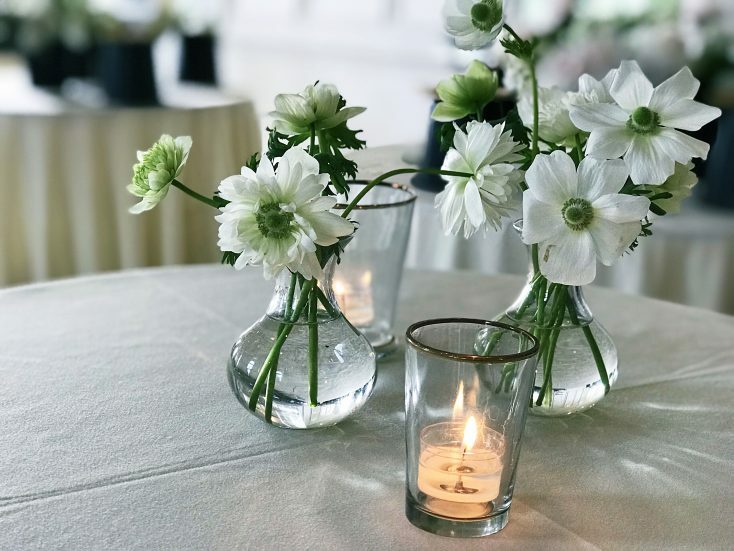 A few smaller arrangements or even single stems in a shallow bowl or small bud vase encourage people to get a little closer to the blooms and notice their finer details. 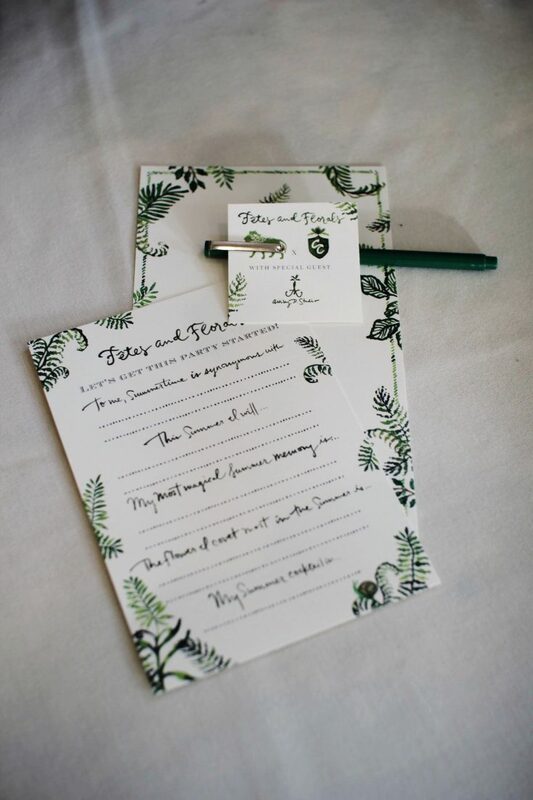 Place cards are a simple and special way to let your guest know you were thinking of them and can serve as a little memento of a special evening. 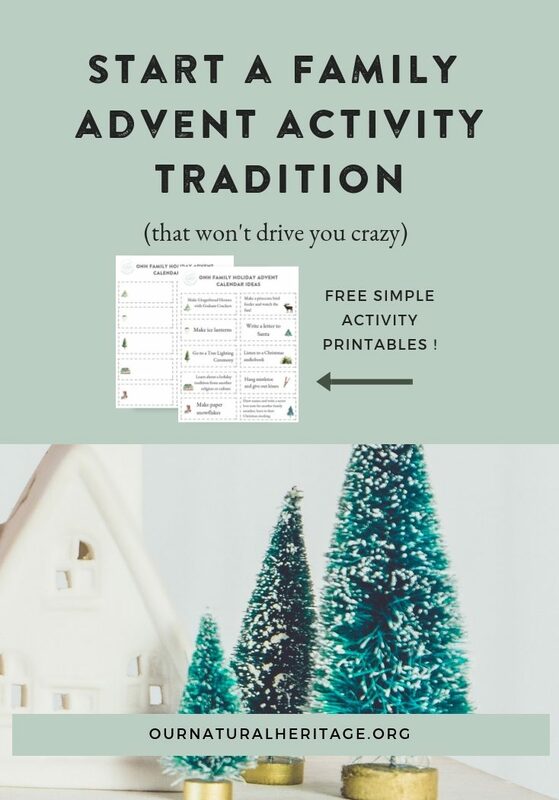 They can also serve a practical purpose too, for example if you are trying some matchmaking, or even just want to be thoughtful in seating your elderly relative closest to the bathroom. I have designed a placecard template inspired by Flowers and Fete to help you host your own magical evening. 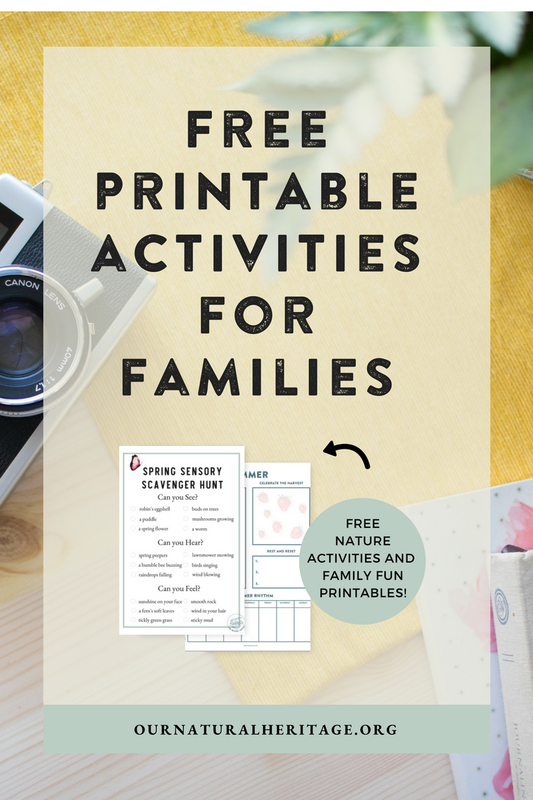 You can find them in our free family fun library. Be sure to visit the Green Lion Design website to learn about future events!